Email-Star Enamel Reviver Polish - 100ml - Removes Lime Deposits and Stains. Gentle cleansing and care for ceramic, porcelain, enamelled steel and enamelled cast iron, Email-Star is suitable for bathtubs, washbasins, shower trays & kitchen sinks. Most sanitary cleaning products on the market contain strong acids to remove limescale deposits.However, because commercial sanitary enamel is not acid-resistant, prolonged usage dulls the surface. Cleaning products containing sand can also cause similar damage. 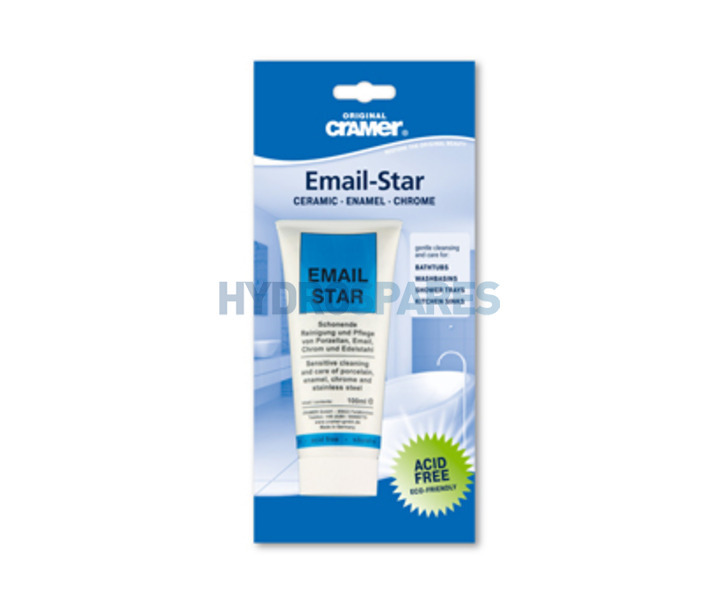 Cramer Email-Star was designed for daily and environmentally friendly cleaning and care and is acid-free and gentle on the skin. It cleans based on a combination of the right detergent with a special polishing compound and has a pleasant scent. Matched to the exact hardness grade of ceramic and enamel surfaces, limescale deposits, discolouration and tough stains are easily removed without damaging the surface. The cleaned surface is dirt-repellant due to the beading effect of the polish. Apply a hazelnut size blob of the paste with a moist cloth or sponge, rub in and then rinse off with warm water. For stubborn stains apply Email-Star on a wine cork and gently rub off with pressure.